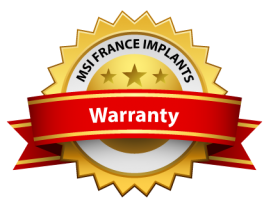 At MSI France Implants , we believe that integrity, professionalism and best customer care are the foundations of our success .We strive to be the best implants manufacturer out there. Having a direct contact to our customers allows us to listen to our customers needs and also helps us offering better value without compromising on quality. MSI France Implants is CE and FDA approved. Read more about our quality assurance and certificates by clicking here. Get our catalogue and hear about our latest promotions for new customers by completing the Contact Form.